One of the most original contemporary musicians. After completing his studies with Heinrich Neuhaus, he was the first to awaken interest at the Moscow Conservatory in Baroque music (particularly performed on period instruments) and contemporary music. He is also an outstanding interpreter of Classical and Romantic works. He has performed with the most celebrated orchestras, working with such esteemed conductors as Vladimir Ashkenazy, Neeme Järvi, Kirill Kondrashin, Christopher Hogwood, Roger Norrington, Mikhail Pletnev, Jukka-Pekka Saraste, Esa-Pekka Salonen, Vladimir Jurowski and Iván Fischer. In historical repertoire, he has performed with the Orchestra of the Age of Enlightenment, Wiener Akademie and Concerto Köln. In recent years, he has taken part in the project This is (not) a Dream with music by Erik Satie and John Cage, directed and performed by the French actress Louise Moaty, appeared in duet with Alexey Zuev, played contemporary Russian music, and also given solo recitals and performed in chamber repertoire on period instruments. In 2015, he received the Cage-Cunningham Fellowship. His recordings include the complete Mozart piano sonatas, as well as piano works by Schubert, Chopin, Beethoven, Brahms and twentieth-century composers. Since 2003, he has recorded regularly for ECM, and recent albums have included Debussy’s Preludes and Cage’s As It Is (with Natalia Pschenitschnikova). 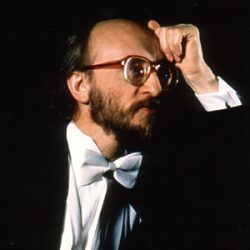 From 2009 to 2014, he made recordings on period instruments for ZZ T/Outhere: Schubert’s impromptus, Beethoven’s last sonatas, Mozart’s complete works for two pianos (with Yuri Martynov), and Haydn’s Seven Last Words of Christ on the Cross (piano version). His most recent recordings have included Tangere (ECM), with works by C. P. E. Bach performed on tangent piano, an album of works for two pianos (with Slava Poprugin) by Stravinsky and Satie (ALPHA/ Outhere) and sonatas by Dussek (Brilliant Classics).